Cloudy with light rain developing this afternoon. High near 55F. Winds S at 10 to 15 mph. Chance of rain 70%..
Cloudy with occasional rain showers. Low around 50F. Winds SSW at 5 to 10 mph. Chance of rain 80%. Jasper Lycette shows Meagan Sokol of the Cannon Beach Academy a book he made during a book-binding class. Students learn different art forms, here working with pysanky or Russian eggs. Art Day was inspired by Seaside's Hayley Rollins. In 2015, an eighth-grader from Seaside School District compelled legislators to sponsor a bill designating April 14 as Honorary Artists of Oregon Day. Seaside High School celebrated the following year by inviting regional artists to lead workshops for all students. Four years later, the school is one of several in the area honoring artists, thanks to the efforts of founder and now-senior Hayley Rollins and other Seaside students. “We’ve been working on trying to make it bigger this year by talking to other schools along the coast,” Rollins said. The high school’s celebration Friday, April 12, will feature two dozen artists visiting the school and teaching workshops on a variety of art styles and processes, including oil painting, pysanky (Russian and Ukrainian egg-painting), calligraphy, book binding, watercolor, origami, stop-motion animation and illustration. Students can select which workshop to attend. In the past, members of Seaside’s Associated Student Body leadership served as student helpers to assist the instructors and manage the event. This year, Seaside’s Future Business Leaders of America chapter has taken on the responsibility, led by Rollins and senior Ana Rojas. Throughout the year, they have presented to other schools, encouraging them to also host Art Day celebrations, and many responded. Artists who visit the high school Friday will lead similar workshops at Broadway Middle School in the afternoon. Seaside Heights Elementary and Gearhart Elementary schools were visited by dance instructors earlier in the month, leading up to a public Bollywood Dance Night, hosted by the schools’ parent-teacher organizations April 5. 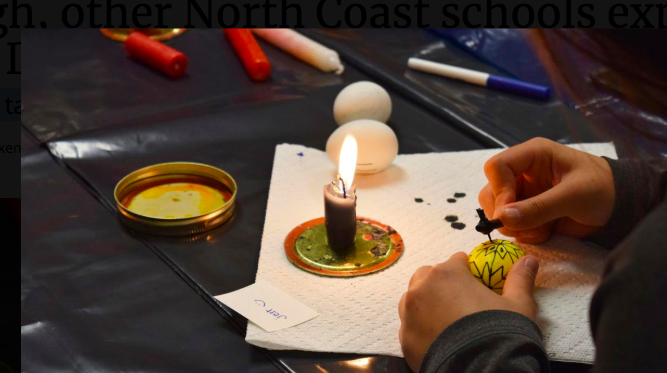 Fire Mountain School, Cannon Beach Academy and Astoria High School also have art-related events planned for April, turning the celebration into a month-long affair, Cannon Beach Arts Association Arts Education Director Meagan Sokol said. The association is getting involved and offering support to ensure the high school’s Art Day continues after Rollins graduates this spring. They have secured grant funding to provide art supplies, snacks and a small stipend for each instructor. As in previous years, artists volunteered their time to lead workshops. In addition to supporting artists in the community, the association emphasizes identifying “ways to get more art into schools,” Sokol said. “Any time there is availability, especially in a fun Art Day like this, I think it’s a really powerful, important thing,” she added. As a licensed art therapist, she recognizes art’s potential to support mental and emotional health. Rollins and other students also described how art — in its myriad forms — helps with self-discovery; processing and expressing thoughts, emotions and ideas; and creating social change.